As bikes are becoming increasingly more expensive it is important to expect value for money and performance out of your 2 wheeled machine. With this in mind here are some beginner's tips to increase the longevity and maintain the smooth and safe working condition of your bike and its components. Your bikes frame and wheels are 2 areas that pick up a lot of dirt and are very easy to keep clean. On wet or dusty days your bike picks up a lot of dirt from the road that can stain the frame and be hard to remove if not cleaned regularly. I recommend a good supply of baby wipes and cotton rags (old t-shirts/ underwear work well) for the frame and wheels in preference to any harsh cleaning products. Stubborn stains can be removed with degreaser. WET WEATHER TIP: If you ride in the wet your bike will bend up dirtier than any other time. To save yourself time later, upon finishing your ride use your outside tap to fill your water bottles and spray all the surface dirt off the bike before going into the house. Give the bike a quick wipe with a rag to remove any additional dirt and to dry its components. Make sure you apply lube to the chain after a wet ride to preserve its condition and prevent rust. LAZY RIDER TIP: If you forget to clean your bike after the wet ride, let the bike dry properly and use a soft bristle hard brush to remove the dried on dirt. Then follow the usual cleaning procedure. One big cause of noise and less smooth riding is the deterioration of the drive-train (derailleurs, crank, chain, cassette). As you cycle the chain picks up dirt from the road which is transferred to the rest of the drive-train. This left unattended will build up and ruin the smooth functioning of your bikes gearing. This build up can leave thick black residue in the chain and on the derailleur which is almost impossible to remove if it gets on the carpet! To clean the drive-train, I concentrate most of my work on the chain, after having removed surface dirt from the crank, derailleurs and cassette with a rag/ baby wipes. Run the pedals backwards (with the bike stationary and propped against something securely) while holding a cotton rag around the outside of the chain. This removes all of the visible dirt, and you can recruit the help of an old tooth-brush if you have any stubborn dirt stuck between the chain links. You can apply degreaser during this process if the chain is really dirty and use a chain cleaning tool if you are really enthusiastic, but I prefer to use baby wipes for that bit of needed moisture and convenience. After cleaning the chain apply lube while back pedalling again to make sure the whole chain gets covered and then use the rag to wipe of any excess lube from the chain and bike (dry lube is fine for most riders use). 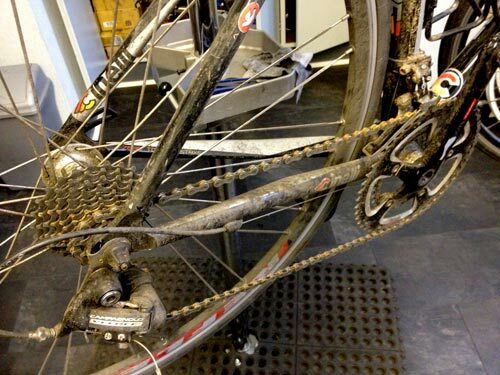 TIP: Keep your chain spotless and well lubed, the rest of the drive-train will follow suit! It's important for ride quality and peace of mind to perform regular, basic safety checks on your bike. Particular focus should be paid to brakes, cables and wheels. Check that the wheels are installed securely into the forks and that skewers are attached firmly, check the tyres for damage, visible debris and appropriate pressure. Check that the brakes are not too worn and set tight enough to reach the rim of the wheels and that the wheel can spin freely. Check the gear and brake cables are in good condition and not fraying at any point. TIP: Learn these basic skills as the general wear and tear of riding can affect these things on a daily basis. Bikes these days are built to last, but unnecessary forced placed upon them can result in damage to the frame and the components. Most unintentional damage occurs when the bike is mishandled and either being transported or stored incorrectly. Be careful when driving with the bikes on the roof.........doh! TIP: Bike racks are a great way to transport your bike and store in the home, it limits frame and component damage by consistently having the bike supported appropriately by its wheels or forks. It's also really easy to clean a bike when on a stand. Every cyclist should have a pot of grease to hand in their tool kit. Grease has many uses in bike maintenance, but primarily it prevents unwanted creaking noises, helps maintain the working order of key components and helps in the prevention of rust in the presence of water. There are different types of grease but I find calcium based grease the most cost-effective and useful for all types of jobs. TIP: Grease your seat-post, pedal threads, cleat screws, bottom bracket cable guide and headset to prevent rust, noises and increase the longevity of these parts. It is important to get a professional service every 6-12 months depending on how regularly you ride, and especially if you have had any accidents or complicated problems with your bike. Cable and chain replacement are 2 common service items that generally require the expertise of a professional and well worth the time and money for a good job. My recommendation is The Fixed Wheel at Manly, great service and a good price. Any comments?Please use the contact page! Happy riding! Older PostSeduced by Kona - 2013!